Being a mom, you are loaded with umpteen responsibilities. You need to run around the house and get stuff done. 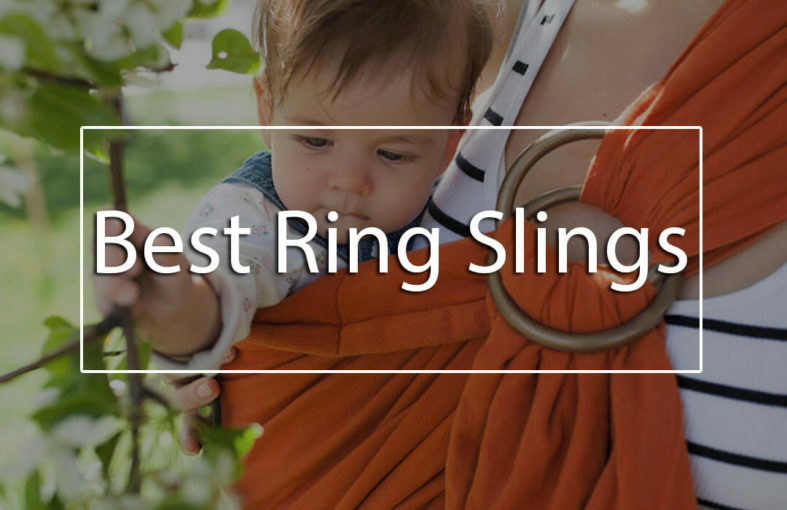 Having the best ring sling by your side will make it convenient to get the work done with your little one. Moreover, if you are outside, it offers the convenience to breastfeed without feeling awkward at a public place. A ring sling gives you the freedom to keep your little bundle of joy close, snuggle him yet keeps your hands free. In this post, we will be discussing about the tips and guide on a baby ring sling. Also, for your convenience, we scouted the shopping website and prepared you a list of the best quality and highly rated ring slings you could buy. Let’s keep on reading. Does Ring Slings Differ from Baby Wraps? How to Make a Ring Sling? How to Wear Ring Sling? Do You Need a Ring Sling? There are only a handful of really good baby ring slings available on the market that we can find. However, this does not mean other baby ring sling brands are not good. It’s just that the other brands do not have a higher buyer satisfaction compared to these 3 ring slings below. Mamaway baby wrap sling is one of the best ring slings available on the market. It is a well-designed high quality ring sling which helps you keep your baby close. Moreover, the stretchy cotton fabric will keep your baby comfortable even for a long time. You can choose different ring sling positions to hold the baby. Whether you want him to stay on his tummy or on his back, every position will be easy to hold. The Mamaway ring sling baby wraps are adjustable and can easily be used by a mom or a dad to hold the baby. By adjusting the two rings, you can securely hold the baby without feeling much pressure on your shoulder or back. It is available in a variety of colors. It is designed with 100% cotton fabric and come with resilient and safe rings. Recommended for - The Mamaway ring sling is designed to carry newborn babies with age range- newborn to 36 months. The Hip Baby Wrap Ring Sling is one of the top-rated baby ring slings. Although it offers medium stretchability, the baby will still stay comfortable. Whether you choose to go grocery shopping or want to go hiking with your little one, this baby sling will make it easy to carry your baby along while keeping your hands free. This bright rainbow colored ring sling is exceptionally stylish and can be paired with any outfit. Moreover, it is designed with eco-friendly material which alleviates all the risks to the baby. A majority of moms are happy with its hands-free design without being concern about the child’s safety. Caring for the fabric is also easy as it can be washed in a washing machine. Recommended for – Babies with a weight range from 8 to 35 lbs. The Maya Wrap Ring Sling is not only comfortable but is also a stylish looking baby wrap. Enjoy a good bonding level with your baby as he won’t get tired of this baby wrap. This baby sling has been specially designed to make the product look attractive yet is extremely practical. Made up of cotton fabric, it is highly breathable and let the baby enjoy a comfortable ride. Moreover, it is equipped with back and shoulder padding which makes it easy to hold the baby for several hours at a stretch. The tail part is longer compared to its competitors. Thus it offers enough room for bigger babies to fit in. The two rings are made up of aluminum and therefore are durable. You can position the sling on the shoulder and distribute the weight evenly. Recommend for – This is an extremely spacious sling and can practically be used for all babies (approximately 8 pounds) and toddlers (35 pounds). Moms can choose to carry their baby in it until they are ready to walk. Are you confused about the ring sling? Well, a ring sling is a piece of long fabric that comes with two rings. The cloth work through the rings to create a pouch that is used to make the baby sit securely. It works across the torso without any buckle, snap or tie and is supported by one shoulder. The best baby ring sling often comes in a variety of fabrics such as linen, cashmere, cotton, wool or silk. However, the only downside you will face is when you choose to wash them. Baby ring sling should be hand washed or machined washed on a gentle cycle with cold water. 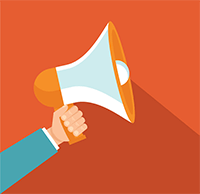 Don’t use a dryer as they must be air dried to avoid shrinkage. Ring slings generally work best with newborn babies; however, you can even choose to use them with toddlers as well. 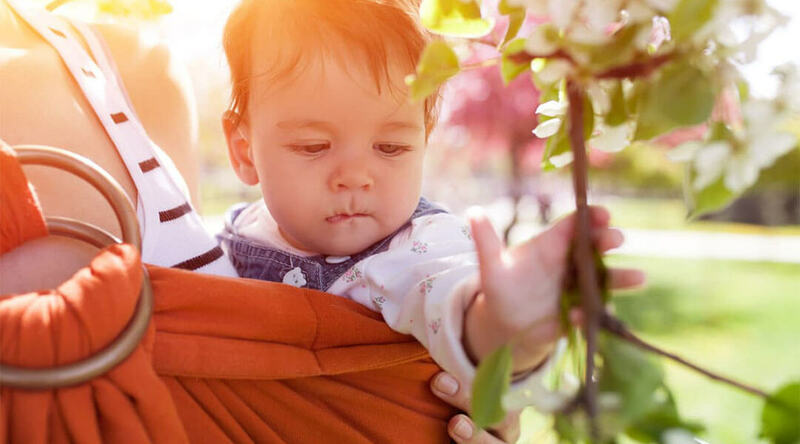 While the product doesn’t have an age limited, but if you intend to use it on an older baby (age 3 and above), then it is better to use an actual baby carrier for proper weight distribution as well as other features. You may think that baby wraps and a sling carrier are same as they are designed to do the same function. However, they differ from each other. While ring slings are easier to get on and off, baby wraps are more complex. Ring slings do not have origami-like configuration while baby wraps go over both the shoulders to provide extra support to the baby. While ring slings are best suited for wearing your baby for short-term, baby wraps are designed to wear the baby comfortably for a long period. If you are a DIY queen, you can choose to make your own baby ring sling. Here are few steps on how to make a ring sling. Baby wraps make it difficult to take the baby in and out a few times. This is when these ring slings can be your savior. Making your own ring sling will take less than an hour. What’s great about these ring slings is that it takes just a few seconds to strap the baby to you and also make them come off. You can wear the sling on your front, back or side. They work best if you are planning to carry the baby for a short interval probably half an hour to an hour. Ring slings also work great in hot weather as there will be less fabric on you and the baby. They are easy to wash, adjust and have an extra cloth that can be used to clean up the baby or use for privacy during breastfeeding in public. Moreover, one size fits all. So, let’s get started to DIY your own ring sling. To begin with, you will need to get your hands on some rings. There are specific ring slings rings available in your local hardware store, so it won’t be difficult to secure them. You can even order the rings online and choose between small, medium and large rings. Next, you need to get your hands on the fabric. You can take your pick from a variety of woven fabrics which are not stretchy. You can choose 100% cotton, linen, muslin, linen/cotton blend, cotton spandex blend, or more. Linen/cotton blend will make up for the best baby wrap for hot weather. So, when choosing the fabric, make sure you pick one which you can see some lights when holding it against the light. You need to buy approximately 2 meters fabric in length; however, you can make it longer if you want a long tail. The cloth should be approximately 70 cm in width. Finish off the raw edges by folding over the edge of the fabric twice. Use an iron to flatten out the edges so that it looks neater when sewed. Finally, sew the edges and make the baby sling look neat. Next, slide the carrier rings on to the fabric and fold over, there must be ample space for the padding to rest on the shoulder. Sew two lines across the sling to make sure that the sling is super secure. That’s it. If you don’t have enough time in your hand for DIY, you can always shop online. Check out our best ring sling reviews and pick a sling which you feel is the best. Below are some excellent videos of DIY ring slings. When it comes to wearing the ring sling, it is quite easy. Start by holding the sling with the rings in one hand and the tail in other. Make sure the fabric is not twisted. Gather the fabric of the tail and pass it through the rings. Next, pass the tail back over the top ring, through the bottom ring. Spread the fabric across the rings and make sure it is not twisted. Flatten the fabric as much as possible. Pass the loop over your head and ensure that the rings land on your shoulder. The tail end must hand down toward the feet in the front. Place the rings as high as possible because they will move down as you adjust the baby in the sling. Now you are ready to put the baby in the sling. Still confused whether you need the ring sling or not? Well, the answer is yes, ring sling often work as a lightweight baby wrap for summer and are also best suited during winters. While there is a number of options available in the market such as soft structured carriers, baby wraps, and babywearing shirt, you should at least get your hands on one ring sling. It will provide closeness of a wrap without being too bulky. While you can choose to DIY a ring sling at home, but if you don’t have enough time, make sure to shop online. We like the Maya Wrap and we think it is the best ring sling for summer as it is designed out of highly breathable material and is also useful for breastfeeding. What do you think about baby ring slings? Let us know in the comments below! !